Yet again have slot developers/designers found a way to theme a game on the lucky symbols of China: This one’s called 5 Dragons, a “243 Ways to Win” slot from Australia-based slots game supplier Aristocrat. 5 Dragons, you say? You’ll definitely be hoping a lot more than that fill these reels....As stated (written?) 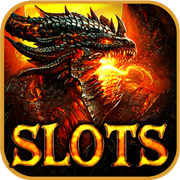 above, the 5 Dragons slot is a “243 Ways to Win” game. You’ll be paying a set amount based on increments of 25¢ running from 25¢ to $100 per spin. If you wager on the “ante bet,” it’ll cost you 25% more, so starting stakes can run 30¢ to $120 per spin. What are the symbols in the 5 Dragons slot? 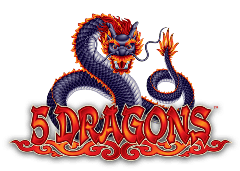 In the 5 Dragons slot game are those symbols well familiar to anyone who’s spun the reels of a China-themed slot before: High-payers include icons such as koi fish, tortoises, tigers and holed coins. Naturally, those titular fire-breathing beasties are in play as well – more on them later – and, because China is so well-known for its love of European and American card games, the A, K, Q, J, 10 and 9 symbols make up the low-paying end of the paytable spectrum. So what are the “5 Dragons” of the title? Good question. The seeming most likely explanation is that “5 Dragons” refers to the most desired outcome on a single spin, though the good news here is that landing just three of these bad boys launches the free spins bonus round. What happens in the free spins bonus round of 5 Dragons? First up comes options! The player is given a choice between 5, 8 or 15 spins with various bonus multipliers (remember that the odds-on best bet may be determined by simply multiplying the number of free spins by the bonus multiplier). If you played the ante bet (or the 30x marker), your options are wider ranging, and you may play 10, 13, 15, 20 or 25. These free spins and bonus multipliers increase every time the free spins are tripped in a single playing session as well; the max bonus multiplier achievable is 30x, which may be achieved more quickly with the “30x” bet set. So the 25x versus 30x is a serious question then? Also of note in the bonus round: an extra symbol, that of a sealed envelope (?!?!?) is added. When these appear in reels 1 and 5 on a spin, multipliers of up to 30x the total wager are paid out. Nice.